In my last post I went on and on and on about how it was getting to be springtime and how that meant fresh herbs were not far behind and how much I adore the taste of fresh herbs in my recipes and so on and so on. Today I’m going to bend your ear about the other wonderful thing about not having multiple feet of snow in your hard, and that is grilling. GRILLING IS BACK. As in, steak that has been marinated in lime juice and fresh ginger and scallions and olive oil and grilled outside until it is tender and juicy and served with some extra lime wedges on the side. It’s like a steak margarita. I speak from having very limited margarita experience (I am a merlot girl) but I think if steak was a margarita, this would be it. Just for the record, however, this is one of the few times I’ve been cut off from my grill for the entire winter. In seasons past, the Southern husband has shoveled a path from the back door to the grill, and this has happened. Because sometimes I have needed…not wanted, needed...grilled tomatoes for a recipe, and he loves me. But this year our grill and everything around it was covered in about 3 feet of mean, nasty, icy, not going anywhere snow. So I’ve been impatiently waiting for the spring thaw, and it finally, finally came. So here comes some tropical tasting grilled steak to celebrate! 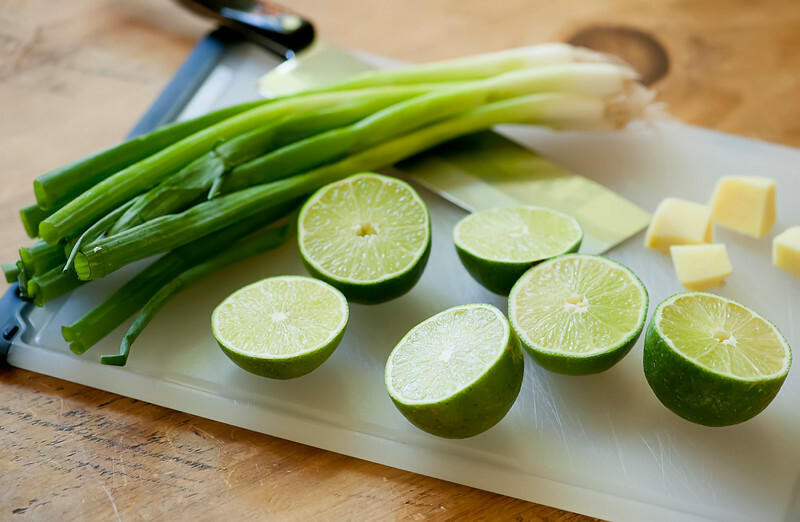 Start by chopping up some scallions and ginger, and squeeze up about 4-5 limes. Pop them in a bag with some olive oil, a little salt and pepper and a nice flank steak. 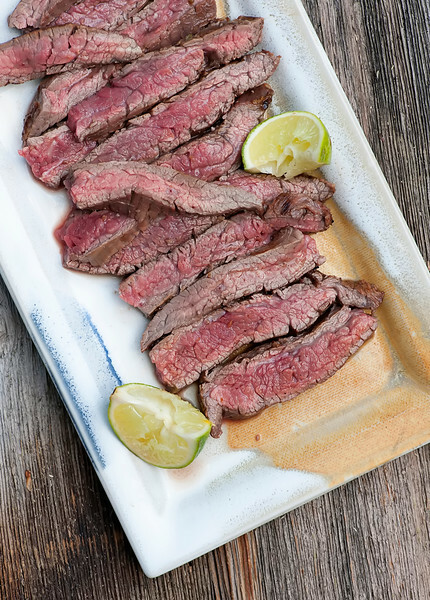 Flank steak can be a little pricey, but the flavor is AMAZING. Let everything marinate for a couple of hours. Now crank up the grill to high and grill it for for about 3-4 minutes per side for medium rare, and a little longer if you are a more well done person. Cover it with foil on the cutting board and let it sit for about 5 minutes to settle. Now slice it against the grain and give everyone a share along with a lime wedge or two to squeeze on top. I hereby declare grilling season officially open! 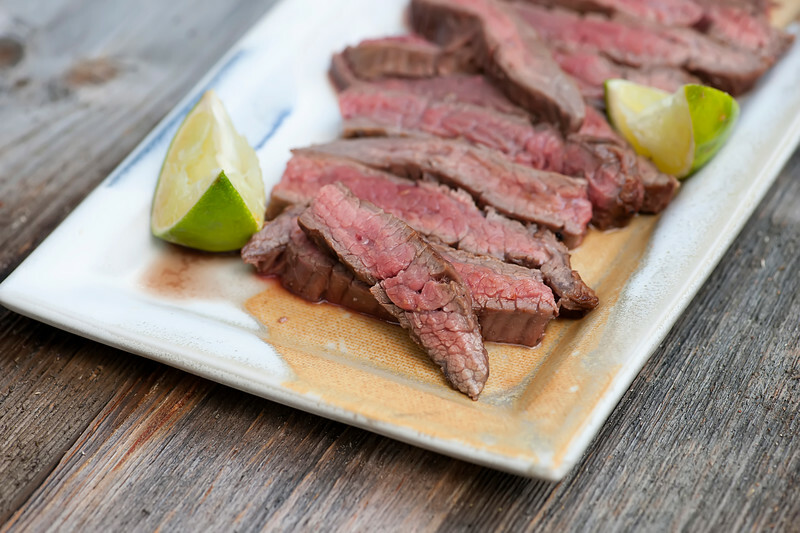 This recipe for lime and ginger marinated flank steak is a great way to kick off grilling season! Combine lime juice plus the rinds, oil, ginger, scallions and salt and pepper in a large zippered plastic bag. Add steak, seal the bag and marinate in the fridge for an hour or two, turning the bag occasionally. Heat grill to high. Take out steak, discarding marinade, and grill for 3-4 minutes per side for medium rare. Let the steak rest on a cutting board for 5 minutes, covering it with foil to keep it warm. Slice against the grain into thin slices and serve with extra lime wedges on the side. This looks delicious! Lime and ginger – LOVE this flavor combo! I’m hungry just looking at this! Oh my goodness! This sounds delicious. 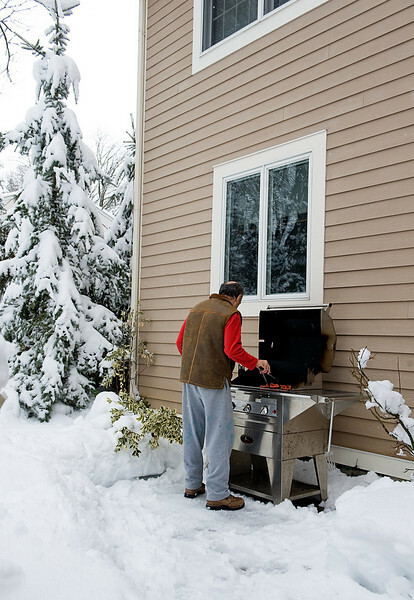 I love the photo of grilling in the snow!! Classic! Love the flavour combination! Lime and ginger sounds so refreshing along with steak. My fiancé would love this!! Thanks Annie! And congrats on your upcoming wedding! Thanks Kara! Fresh ginger and lime taste like summer all year long, don’t you think? I really love grilled flank steak and I can’t wait to start grilling out! It’s amazing how a cheaper cut of meat will grill up nicely with a nice tenderizing marinade. Love the idea, tanks! We are having this for dinner and I cannot wait! It looks AMAZING!